We read with great interest the recent Gut publication by Schepers et al1 reporting no association between the time of onset or duration of persistent organ failure (POF, >48 hours, distinguished from transient organ failure <48 hours) and mortality in a subset of patients (240/639) with acute pancreatitis (AP). Previously it has been proposed that there are two peaks of POF and mortality in patients with AP, namely the early phase (first week) accompanied by persistent systemic inflammatory response syndrome and late phase (>second week) caused by infected pancreatic necrosis (IPN).2 Patients with early fulminant POF have been considered to have a higher mortality than those developing POF later,3–6 and those with POF in combination with IPN to have a higher mortality than those with POF alone.7 The findings from Schepers et al1 have challenged these views but require confirmation. We have determined whether their findings are applicable to our AP patient populations. We analysed 2145 and 939 patients with AP from retrospective (single centre) and prospective cohorts (multicentre), respectively, who were admitted ≤48 hours of symptoms onset (online supplementary table 1). There were 469 (21.9%) and 132 (14.1%) patients who had POF in these two cohorts, respectively. Our data demonstrate that the prevalence of different types of POF (including respiratory, cardiovascular and renal failure) all peaked during the first week; the patterns were similar in the retrospective and prospective cohorts (online supplementary figure 1). Of 601 patients with POF, 370 (61.6%) had an onset ≤24 hours of admission, followed by 159 (26.5%) on day 2 and 40 (6.7%) on day 3 (online supplementary figure 2). Mortality was related to the number of organs that failed: 5.5% (25/453) for one, 44.9% (35/78) for two and 88.6% (62/70) for three (online supplementary table 2). Our data were in accord with Schepers et al1 showing no biphasic pattern of mortality in the total 3084 patients, with a single peak ≤2 weeks followed by a steady decrease >2 weeks (figure 1). There was no significant increase in mortality among patients with POF and IPN compared with those with POF and no IPN (median 26.3% vs 19.4%, p=0.16) (online supplementary table 3). 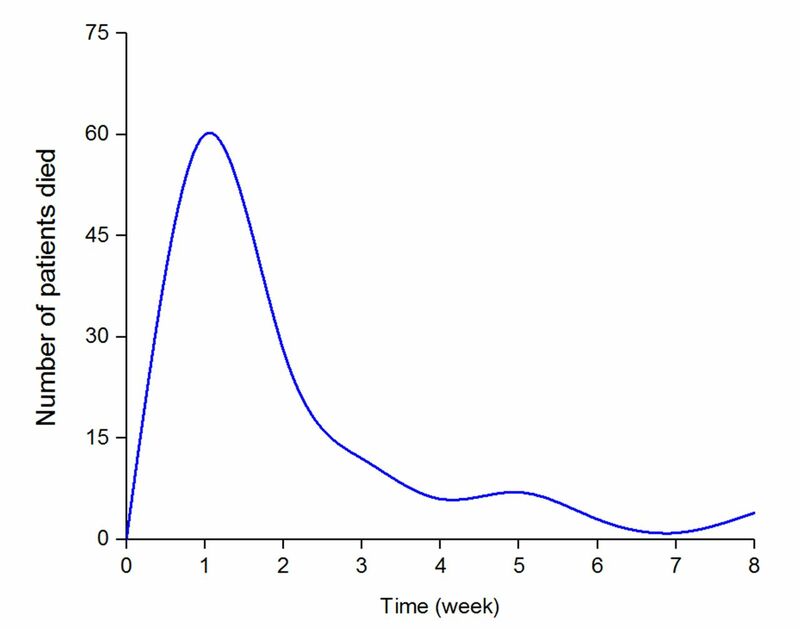 Pattern of mortality over time in patients with acute pancreatitis, showing the number of patients who died on a weekly basis for a total of 123 deceased out of 3084 patients. Our large multicentre series confirms that there is a single peak in incidence of POF and mortality in AP but in contrast to the Dutch data, we found a relationship between the duration of POF and mortality. Recent improvements in the treatment of IPN have erased the second mortality peak and demotes IPN as a determinant of mortality.7 We maintain that shortening the duration of all organ failure is an important treatment target and should be routinely reported. This is illustrated by recent findings that early initiation of aggressive fluid therapy may be helpful, but if delayed 6–8 hours after admission the risk of POF and mortality may be increased.9 The frequent early onset of POF and impact of its duration underline the importance of door-to-needle time10 and the duration of POF as an outcome in clinical trials of new treatments for AP. The authors thank all the members of the pancreas multidisciplinary teams in West China Hospital, Royal Liverpool University Hospital and University Hospital of Santiago de Compostela. NS and TL contributed equally. Contributors NS and TL are co-first authors. RS, QX, WH and JAW conceived, designed and supervised the study, and obtained funding. NS, TL, DdlI-G, TJ, LD, LL, PZ, WH, ZZ and JED-M acquired, analysed and interpreted the data. NS, TL and WH wrote the paper. RS, QX, JAW and VKS undertook critical revision of the manuscript for important intellectual content. Funding This work was supported by the NZ-China Strategic Research Alliance 2016 Award (China: 2016YFE0101800, QX, TJ, WH and LD; New Zealand: JAW); Key Technology R&D Programme of Sichuan Provincial Department of Science and Technology (2015SZ0229, LD and XQ); National Science Foundation of China (No. 81703911, TJ; No. 81774120, QX, WH, TL and TJ); Biomedical Research Centre and Biomedical Research Unit Funding Scheme of the National Institute for Health Research (TL, WH and RS); and National Institute for Health Research Senior Investigator Award (RS). Ethics approval Liverpool Acute Pancreatitis Research Biobank was approved by the UK Health Research Authority (reference: 15/YH/0193). Data sharing statement Upon publication raw data from individual studies may be requested from the corresponding author to interested researchers requesting data for bona fide scientific purposes.